. ana maria micu's newsletter .
. artist-in-residence finissage announcement . The mere relocation does not separate the production of new artworks from previous ones. This small observation determined us to favor the idea that art creation is a symbiotic process with ongoing ordinary life in its specific routine, a mimic of sorts applied to normality’s background. The intention of this exhibition, as suggested by the “tableau vivant” reference from the title, is to reconstitute a framework in which this mimic of ours could be also reinterpreted by the viewers. To encourage this, we present images deprived of any human presence, so they would constitute a décor for an action that only the visitors would animate. The entrance to the exhibition is made through a slideshow that documents images that theoretically could be called studio views, but in our particular case differ from what is usually recognized as such. We work in improvised rooms meant to function somewhat as art studios, without ever being fully equipped with professional furniture or tools. The archived visual consequences resulted from this fact of life are illogical images, inexplicable scenes, and spontaneous juxtapositions, in most cases dictated by the need to adapt, to use whatever is first available. We therefore encounter certain poetry in these situations, because the object's primary purpose is diverted into an aim whose necessity perpetually remains changeable, questionable and far from obvious. Just as our studio images contain paintings, we include in this exhibition 2 painted works that are presented in such a way that they seem to be part of a larger context with an open and ambiguous purpose. The installation “Dream catcher” speculates around the domestic habit of decorating the bedside wall with a painting. 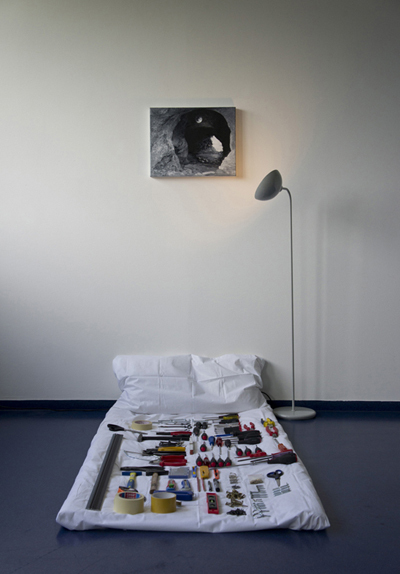 The bed is here represented through a minimalistic improvisation – a thin mattress, a pillow and a white sheet. All of this is covered in tools and objects left for us to use during our residency. Above the bed hangs a small sized painting illuminated by a lamp. 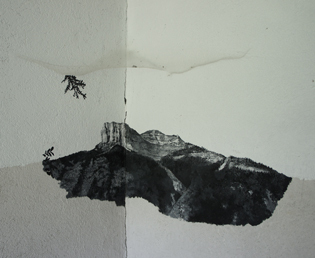 The painted image represents a tunnel piercing through a stone wall towards an empty landscape. In the blackness of the tunnel's ceiling one can see The Moon surrounded by the flickering lights of the deep space, a scene that breaks the rules of known reality. Besides the above-mentioned installation, the exhibition presents another painting (approximately 200 x 200 cm) in the form of a canvas taped directly on the wall. The work will remain unfinished for the opening of the exhibition, thus discussing again to which degree this painting is an artwork, a realistic décor similar to illusory panels employed in theaters or a vehicle for an open image, which begins behind the canvas and continues in the space in front of it, integrating the viewers’ presence. This painting depicts the interior of a mountain cabin with an open door towards the outside. Hanging on the wall next to the door, the viewers can note a deer-head trophy. Overlapping the antlers, reproduced in graphite, there is a patent drawing of Nikola Tesla for "Apparatus for producing electric currents of high frequency and potential".
. my portfolio website . I updated my website! Did you notice? Check out my new works from “Tender heart, keep still!” (2012).
. my facebook profile . Visit my wall to find installation views from previous shows, "making of" pictures from my studio, other artists and projects I like or more mundane stuff. Ana Maria Micu (b. 1979) is a Romanian visual artist based in Craiova. She experiments with combinations of paintings and drawings, pictures-in-pictures type of images and mental constructs of reality triggered by fragments of text she adds directly on the painting surface or as titles for her works. Her last solo show is “Tender heart, keep still!” (2012), presented by C-Space Gallery, Beijing. The propeller of the project is the artist’s controlled intention of putting herself in a state of empathy with an unfamiliar audience by watching Chinese romantic movies from a list that she eventually narrowed down to several films of the director Jia Zhangke. The exhibition sustains what she built as the thinking pattern of a kindred-spirit, in which images of the artist’s domestic environment and of her friends’ life are combined with a piece of text cut in the painted surface of one work. The fragment resembles lyrics that could be read as an encrypted folk song, but actually the lines are selected quotes from the English subtitles of "Still Life", Jia Zhangke's most famous movie. Micu graduated 8 years ago from the MFA of the University of Art and Design of Cluj-Napoca in Romania and, besides “Understatement" (2009), a duo-show with Cătălin Petrişor, curated by Maria Rus Bojan, she also has been included in an earlier group show with C-Space, "Strategies for concealing", in 2008, put together by the same curator. In 2006 and 2007 Micu was shortlisted for BP Portrait Award, organized by National Portrait Gallery and exhibited in London and on tour throughout the UK.